Tickets are still on sale at the door at $40 each. This event is fully tented to keep everyone dry. Come on down ! 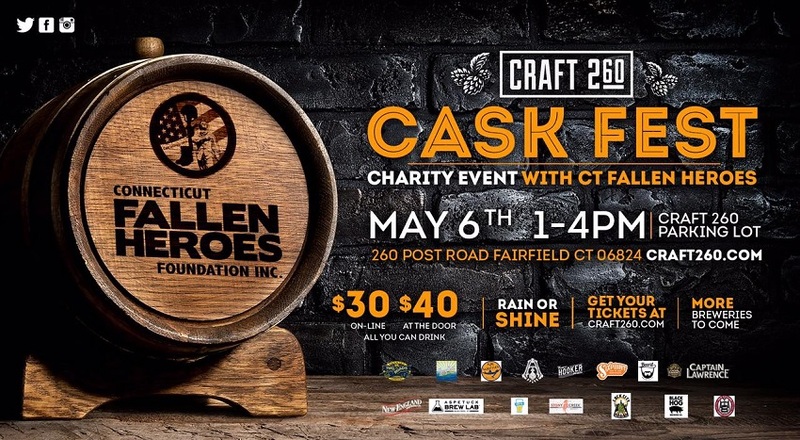 You're invited to the Craft260 and Connecticut Fallen Heroes Foundation Cask Festival charity event! 20+ Local breweries will be bringing two casks each created special just for this event. You won't find these beers anywhere else! Enjoy live music hosted by DJ for entire event (DJ to be announced). This event will be held in the Craft260 parking lot. This is a charity event for Connecticut Fallen Heroes Foundation. Must be 21+ years old. No children, no pets. Only 300 tickets will be sold for this event to ensure a great experience for all who attend. This event is rain or shine. Get your tickets before they're gone!